This Saturday the flag will drop to start the 49th 24 Hours of Daytona and a chance for a BMW to earn another shot at winning a grueling, hair raising international endurance race that’s played an important role in BMW Motorsport history in the United States. This year’s race will see BMW represented in two forms: in the GT category via the E92 M3 and Daytona Prototypes. While Daytona has seems to have lost it’s luster in recent years possibly due to the popularity of NASCAR’s own Daytona 500, the 24 Hours of Daytona is a highly respected event with a rich history shared only with a handful of 24 hour endurance races across the globe. BMW has significant ties to the 24 hour enduro, as well. In 1976, a 3.0 CSL was piloted to victory at the hands of Peter Gregg, Brian Redman and John Fitzpatrick completing a distance of 3368.035 km and interrupting the dominant Hurley Haywood in the Brumos 911 RSR. After a successful stint in the Pro Car series, an BMW M1 was converted to IMSA GT spec and run throughout the 1980’s and even won the GTO class and finished 6th overall with Hans Stuck behind the wheel in the 1981 race. Fast forward a few years and the 24 Hours of Daytona, sponsored by Swiss watchmaker Rolex, has a greater focus on the Daytona Prototypes – chassises and engines designed for performance but also relative cost efficiency – and the GT class which runs a similar specification to the GT3 class of the FIA GT3 Championship. Under the GT category, cars have a power output range of 390 to 450 horsepower and a maximum speed of 180 MPH. Cars can be a caged, lightly modified version of the production car or a custom tube chassis. However, rules mandate things like output, weight and tire sizes in this category all of which leads to one thing: close racing over the span of 24 hours in the GT class. This year, as we’ve already shown you, Turner Motorsport has moved from the M6 chassis of last season to the E92 M3 and from the looks of the video below – they know this car inside out! However, with Turner’s new entry into GT via an M3, they’ll continue to face stiff competition from the likes of Porsche GT3’s, Mazda RX8’s, Camaro’s, Mustangs and the odd Ferrari 430C. With a field this fierce, mechanical reliability and a strong driver line-up should be key to a class win for the sole BMW M3 in the GT class. With two of their four drivers stand outs as former and current BMW drivers, Boris Said(of BMW M3 GTR fame) and Bill Auberlen(currently racing in the BMW M3 GT in the ALMS) Turner seems to be leaving little to chance – especially with their intimate knowledge of the E92 M3 and S65 powerplant. Fans can certainly be guaranteed of close quarters combat in GT racing. If the wheel-to-wheel GT racing isn’t enough for you – fans can also tune in to see the BMW Riley chassises in the Daytona Prototype class streaking around the infield and high bankings of the speedway. In between the tube chassis, you’ll find a massive 5.0L V8 to power the lightweight prototypes. 2011 hopes to be a more promising year for the BMW Riley chassis of with a hopeful overall win compared to the 2nd place finish of the BMW-powered Chip Ganassi Racing team. Beyond racing, the 24 Hours of Daytona will give many the chance to the see the only 1 M Coupe in North America take to the track as the official pace car. 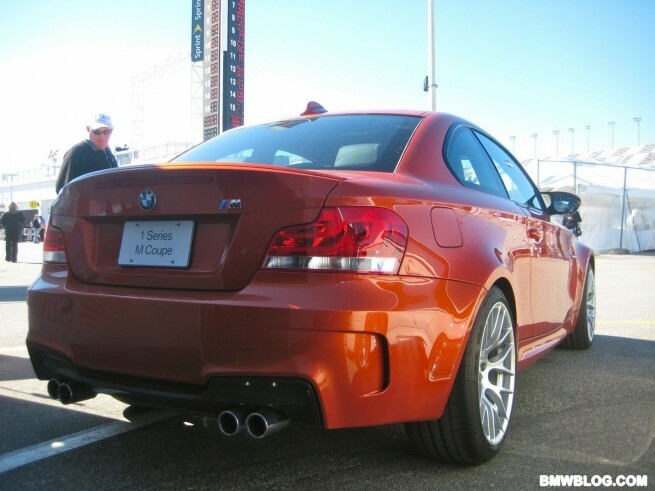 As you’ve all seen, the 1 M Coupe was caught out on I-95 South heading towards Daytona earlier this week on a special “shakedown” prior to the race – while we’ve not been in the 1 M Coupe yet, we’re quite confident that it’s up to the role of guiding a field of V8’s. Either way, the Rolex 24 Hours of Daytona has a lot to offer fellow BMW enthusiasts and we recommend you tune in as there seems to be a wonderful blend of everything from a new road car to roaring teutonic monsters to keep fans happy. We’ll be trackside tomorrow morning to kick off the race and provide coverage!